Numerous Campaign Strategy Newsletters have reported on how people’s unconscious motivational values affect development of ‘issues’ and responses to offers and asks, at an individual level. 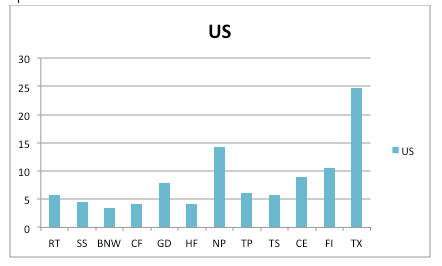 At a group or national level, the relative proportions of the ‘Maslow Groups’ of Settlers, Prospectors and Pioneers, and within them the twelve distinct Values Modes, affects the ‘tone’ of a society, affects it’s priorities and reflexes, and dynamics such as the acceptance or rejection of change, innovation or upkeep of traditions. 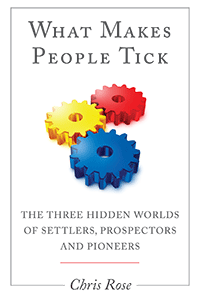 This is explored in the book What Makes People Tick: The Three Hidden Worlds of Settlers, Prospectors and Pioneers, while descriptions of the Values Modes can be downloaded at the homepage of www.campaignstrategy.org and at the CDSM (Cultural Dynamics Strategy and Marketing) website www.cultdyn.co.uk. 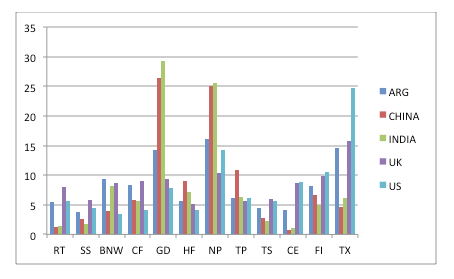 This blog shares the results of values surveys run in five countries in 2012. Each was conducted by asking over 2000 people a set of questions used by CDSM, which can generate the values segmentation. Apart from the UK, the surveys were all commissioned by Greenpeace. A future post will relate the values differences to responses to questions relating to climate change but here are some data on the national population differences, with a short commentary. A general introduction to values can be found in the paper ‘Using Values Modes’ at the homepage of this website and this paper updates some of the examples given there. Evidence suggests that as Maslow proposed, people start life as Settlers and may, as and if they meet their dominant needs, transition into Prospectors, and then sometimes to become Pioneers (Security Driven > Outer Directed > Inner Directed). In contrast new behaviours start with the Pioneers, and if they spread, move first to Prospectors and then to Settlers. Some of the key orientations are captured in the annotations shown below. 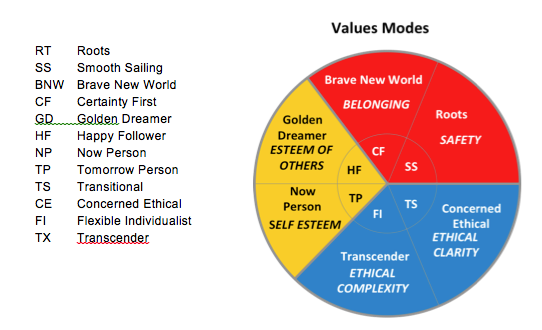 (The ‘inside’ Values Modes are driven by the same general motivational pulls as those lying further to the ‘edge’ – they are in effect like pale reflections of the outside edge Modes). 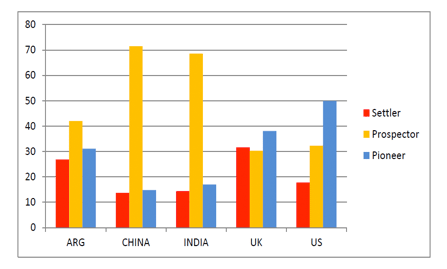 The table and chart below show the Maslow Group percentages for the National Populations of five countries: Argentina, China, India, the UK and the US. Note that in the case of India and China these are drawn from a sample of the urban population only (from the larger cities). This is because standard market research survey systems are not easily available for rural areas in those countries. It might be expected that the rural population would have larger numbers of Settlers. In the case of China there are some indications from other surveys that smaller cities, and rural areas are not very dissimilar to these city populations. The notion that these are large populations are extremely traditional and Settler-dominated is probably out-dated. Indeed the UK is shown to have the largest proportion of tradition-minded, socially-conservative Settlers, followed by Argentina. This may partly reflect the much slower rate of change in the UK and Argentina, and their older age structure. The vast Prospectors segments in China and India reflect not only the rapid social change in those countries but also the relative youth of the populations. 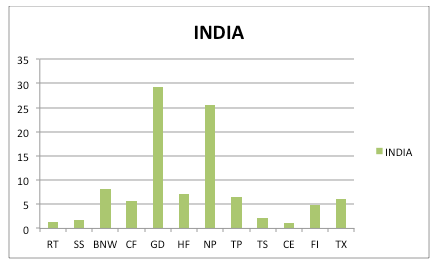 The fact that over 70% of the Chinese population is Prospector, and almost 70% in India, demonstrates the huge importance in those societies of providing a pathway to individual and family success – whether this takes the form of material success, such as goods and possessions, or other symbols, such as educational qualifications. The implications for campaigners are clear: to engage wide support in those societies, the default communication needs to be Prospector-friendly, and any social issue which results in a values clash where Prospector aspirations are threatened, is likely to be very problematic. In marked contrast, the United States, which to many Europeans at least, is still associated with a very Prospector, ‘materialistic’ form of the “American dream”, is found to be by far the most Pioneer dominated society, at 49.9%. The proportion of US Pioneers has grown significantly since a CDSM/Environics survey conducted in 2004, when it was Prospectors who made up 49.4% of the population. In the short term at least, one consequence of the much increased number of US Pioneers is that default assumptions about how-things-work in America will be found wanting. Institutions often change even more slowly than values, which in themselves usually reflect generational (ie cohort) effects. Both some corporate brands and political institutions may therefore struggle to adapt to changing ‘public values’ in the US. More broadly, foreign expectations of the US may also be based on out-moded assumptions. As in any society where this occurs, the small US Settler segment is likely to feel increasingly over-looked and stranded, which may encourage the emergence of tightly organised Settler-dominated minority groups, based around tradition and, most of all, group identity. Of course, how values differences play out in societies, depends hugely on their different social systems, for example if elites or particular groups hold power and/or if political institutions become polarised along values divisions. 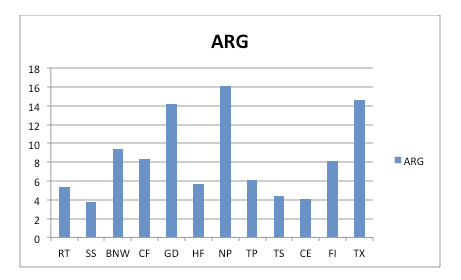 At this gross values level, Argentina looks very similar to many European societies, rather more Prospector than the UK but with Maslow Groups of roughly similar sizes. In the UK, the gradual decline in the number of Settlers, noted in repeated values surveys by CDSM and its fore-runners in the 1970s – 90s, and reversed slightly in the recession-influenced mid-late 2000s, appears to have stabilised. Prospectors are now the smallest group by a small margin, possibly with implications for political strategies aimed at pleasing these ‘aspirational classes’. Over time, barring extreme social disruption, one can expect societies such as India and China to become more like Argentina, the UK and eventually, the US, in terms of Maslowian values. This has many implications, for example the transitioning of topics such as care for nature/ the environment or “being green” from ‘alternative’, to fashionable, and then to ‘normal’ and finally, to traditional. The same could apply to ‘universalist’ causes such as human rights, and the most significant driver, as documented by authors like Rosling and Ingelhart, is socio-economic development, including health and education. 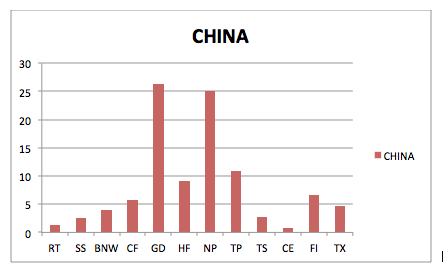 The chart above demonstrates the numerical importance of the Prospector Values Modes ‘GD’ or ‘Golden Dreamer’ and ‘NP’ or ‘Now People’, especially in China and India, but also in the case of NPs, in all the countries. What this does not show is the dynamic influence between NPs and GDs in terms of change. The NPs are more confident and experimental, and the GDs and other Prospectors tend to follow them in new behaviours. 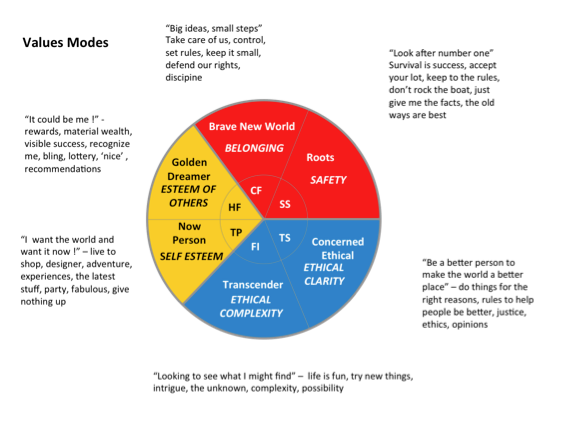 It also shows the importance of the ‘terminal’ Values Mode, the Transcenders, who have the most forgiving and holistic attitude of all the Modes, and overall tend to be the most influential in breaking new behaviours because they may be emulated by the NPs more than any of the other Pioneers. 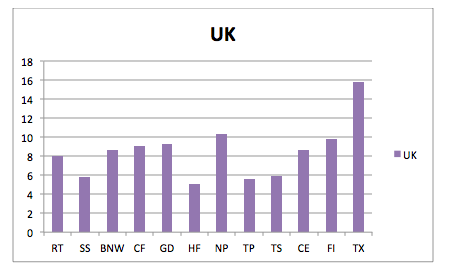 TXs or Transcenders are now the largest single Values Modes in both the US and the UK. We found from other non values-segmenting questions in the Greenpeace surveys that the TX and the NPs are most frequently the most ‘progressive’ on environmental issues, and in China and India, it is often the NP Prospectors who have the ‘greenest’ opinions (although this does not always mean that views are turned to actions – that depends largely on the values profile of the available offers or asks). Acknowledgement: many thanks to Greenpeace and to CDSM for permission to publish these data.